The ten year plateau is a phenomenon that happens in education when educators begin to flat line in their professional growth. Educators, like their students, are on a trajectory of growth from the minute they hit the classroom fresh out of college until about ten years. With most jobs in the 21st Century there is no longer an expectation you will even stay in your job for ten years, much less a life time. But education comes with a history of tenure and longevity. It comes with an anticipation of lifetime security and a great retirement. Thinking about a plateau in your education career becomes a threat to that beach house you have your sights on 15 more years down the road. Educators must understand the reality of the ten year plateau. Gordon Grant, Principal at Hall Fletcher Elementary in Asheville, North Carolina has also made this observation. As keynote speaker at Western Carolina University for recent (2015) administration graduates he stated “I find it takes five (years) to initiate change and sustain it, a few more to institutionalize it so that the change patterns are structural rather than personality driven, and then a year or so to initiate a succession plan base on the structures you’ve created.” Educators must take control of their selected career path by building professional capacity as a teacher leader so they can “grow out” of their current position with plans for moving forward in their careers. Start by carefully examining your professional development plan (PDP). This may be a formal written plan or an informal plan you begin to document yourself. For some a PDP is a matter of compliance. Do not be superficial in your self examination. Your administrator will see through any attempt not to have a meaningful growth mindset. Your plan really should be a tool to help guide you through a process of building your capacity and longevity in a career as an educator. Think carefully about what your intentional plan for professional growth will be. Set short term and long term goals and outcomes. Your intentionally planned professional growth should be coupled with evidence of the impact of your growth on student learning. In this high stakes world of testing that affects teachers as well as their students, it is crucial to link your professional growth to that of your students. Your personal professional development must be specifically linked to evidence based and research based best practices, differentiation, formative and summative assessments, diagnostic outcomes, and self-assessment for student and teacher. Be a reflective practitioner and be able to substantiate your growth through data and evidence that links back to your students’ growth. While building your personal professional development, you must also be willing to be an active participant in professional learning networks (PLNs). PLNs come in a variety of forms and you should be vested in more than one. You are likely already bound to a Professional learning Community at school. Some are bound to more than one. Become actively engaged in other networks such as a MOOC, an online support through ed chats on social media like Twitter or Facebook. Go above and beyond the expectation of what is happening in your building and stretch your network to give you an edge in emerging trends and movements. This will help you be the lead and guide for your colleagues. Your attitude regarding your professional growth is vital in your charge towards professional growth. Research indicates teachers’ gender, age and duration of service create a significant difference in their attitudes towards professional development activities. The results show that teachers who are younger and those with less service time had better attitudes towards professional development activities. It also indicates those at the ten year plateau tend to resist professional development activities as well as express negative attitudes towards a growth mindset. Be careful not to let your mental model sabotage your ability in the classroom. Taking ownership of your career path will help you find deeper satisfaction from your work. Make yourself marketable. Are you certified to teach in only one or two areas? Think about areas of high need in your district. Then think about another area of interest to you. Begin working to add on that area of certification to your current license. The more areas you are certified in, the more marketable you become. This is important because it is a key indicator of your versatility and range. When you magnify your marketability your supervising administrator will want to work with you to help you discover, develop, and differentiate your top talent to address areas of need and shortage. Career transitions can become self-discovery journeys. They can also help you extend your career by allowing you to transform into an area for personal growth. Be open to opportunities you never thought before a possibility. From east coast to the west, state legislators are using this phenomenon to initiate conversations about tenure. Tenure is important to teachers. It is the legal protection granted to teachers that requires the school district to prove just cause before a termination. Tenure is earned through a multi-year evaluation process of a teacher in a probationary track position. It either is given at an earned career status or possibly requires a vote of the governing body of the school. Once tenure is granted, a teacher is no longer considered an “at-will” employee (an employee that can be terminated for any reason at any time). In order to terminate an employee with tenure, a school district must show that it has “just cause” to do so, typically at a hearing before an arbitrator. Tenure is not a lifetime job and tenure does not equal retirement. If an administrator is doing his/her job evaluating and collecting documentation to retain excellent teachers or process out ineffective teachers, then tenure really becomes a non issue. It is up to the school leader/principal to help poor teachers improve or remove them from their job altogether if they are impeding success of their students. Some legislators believe that removing tenure will help in a move to get rid of ineffective teachers. Thus possibly reducing the state retirement pool. With state retirement pools growing as baby boomer teachers begin to seek retirement, legislators have realized that from an economic view they need and want to reduce the state teacher retirement pool as it drains state budgets. 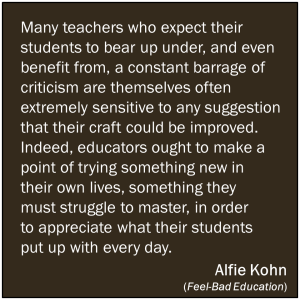 “Many teachers who expect their students to bear up under, and even benefit from, a constant barrage of criticism are themselves often extremely sensitive to any suggestion that their craft could be improved. Indeed, educators ought to make a point of trying something new in their own lives, something they must struggle to master, in order to appreciate what their students put up with every day.” Just as our students shouldn’t feel threatened teachers should not be threatened either. Yet they should be aware of their job performance as well as their ability to become stale in their profession. This makes all the difference between a growth mindset and a deficit mindset. This is why being in an uplifting and positive school culture is key to teachers and students growth and success! Continual development and improvement is something that is part of our life long journey as educators and in creating life long learners. What are three things you can do to build a positive culture in your classroom for your students? Now think of three things you can do in your department or grade level. And three more you can do for your school. Barber M (2004) Plateaus and How to Get off Them. Speech to the Chief Education Officer’s Conference. Gladwell M (2000). The Tipping Point. Little, Brown. Jacob, B. A. (2005). Accountability, incentives and behavior: Evidence from school reform in Chicago. Journal of Public Economics, 89(5-6): 761-796. Lanier, J.E. and Little, J.W. (1986, 1994) Research on teacher education. In M.C. Wittrock (ed.) Handbook of Research on Teaching, third edition. New York: Macmillan. Showers, B. (1986) Skills derived from research on teachers’ response to training. Paper presented to the annual meeting of the American Educational Research Association, San Francisco.